Dichtomatik Ltd, specialist supplier of sealing products, has been appointed as authorised UK distributors for the Kalrez range of perfluoroelastomer reliable, long-term sealing products manufactured by the DuPont organisation. These products are designed for applications involving extreme chemical, thermal and other challenging environments. The range includes �O� rings, mouldings and custom shapes, with cords also available to accommodate special sealing sizes without resorting to expensive special tooling. Typical industries include food and chemical processing, oil and gas, power generation together with pharmaceutical production. With many years experience of sealing products, Dichtomatik can offer a first class service not only in the supply of Kalrez products, but also in technical back-up and support. Kalrez high performance perfluoroelastomer products are designed to optimise total system costs for pumps and process equipment. Where conventional seals need to be repeatedly replaced, involving excessive downtimes, then an extended service life (up to four times) offered by the Kalrez products can show considerable cost savings on lifetime operations. Proportional savings can also be achieved even where lower seal failure rates are the problem. Kalrez parts retain elasticity and recovery properties even after long-term exposure to service temperatures up to 375�C. They also exhibit low compression set characteristics, maintain elastic recovery and recover better under compression than many other perfluoroelastomers. This ensures better shape retention under prolonged stress to achieve tighter sealing for longer periods. They also withstand in excess of 1800 chemicals, solvents and plasmas which can help users reduce stocking levels and lower inventory costs. 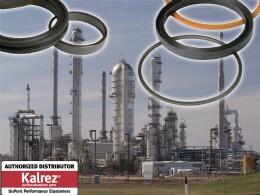 The Kalrez products supplement an extensive range of standard engineering �O� rings and other sealing items also available from Dichtomatik, with extensive stocks held to ensure immediate delivery for most components. Does your packing set really need end rings?